British consumers are eating the right quantities of red meat and can continue to enjoy it as part of a balanced diet, according to health experts responding to the latest study linking red meat to cancer. The research jointly funded by Cancer Research UK and published today in the International Journal of Epidemiology found that people who eat red and processed meat within Department of Health guidelines are still at increased risk of bowel cancer. The cancer charity said the research had shown people eating around 76g of red and processed meat a day, roughly in line with government recommendations, still had a 20% higher chance of developing bowel cancer than those who only ate about 21g a day. The researchers studied the diets of nearly half a million British men and women, aged 40 to 69 when the research began, over more than five years – during which time 2,609 of them developed bowel cancer. One in 15 men and 1 in 18 women born after 1960 in the UK will be diagnosed with bowel cancer in their lifetime. This study found that risk rose by 20% with every 25g of processed meat (roughly equivalent to a rasher of bacon or slice of ham) people ate per day, and 19% with every 50g of red meat (a thick slice of roast beef or the edible bit of a lamb chop). 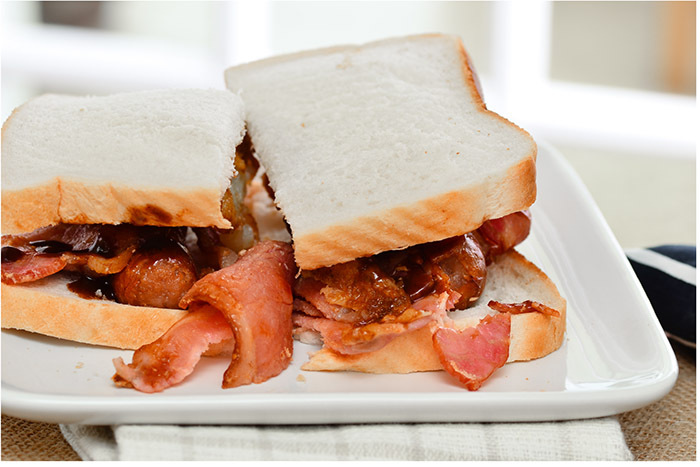 The findings inevitably prompted plenty of headlines linking consumption of bacon to cancer. However, Carrie Ruxton, of the Meat Advisory Panel, attempted to put them in context. “Red meat provides valuable nutrients, such as protein, iron, zinc, vitamin D and B vitamins. Meat consumption has declined significantly over the past few years and average intakes are now well below NHS guidelines” she said. She stressed that there is ‘no consistent evidence’ that any one food, including red meat, causes cancer. “Instead, it’s known that a range of lifestyle factors have a significant impact on the risk of bowel cancer, most notably age, genetics, lack of dietary fibre, inactivity and high alcohol consumption,” she said. “Previous UUK studies, including those published by Prof Key’s group, have found no statistical differences in mortality rates or bowel cancer risks between meat eaters and vegetarians. This is why we need to consider the totality of evidence, not just one study”. Alan Clarke, chief executive of Quality Meat Scotland (QMS), also stressed the lack of consistent evidence said that red meat, or any one food, causes cancer. Pointing out that other UK studies have found no statistical differences in mortality rates or bowel cancer risks between meat eaters and vegetarians, he said the report highlights a range of other factors, which have an impact on the risk of bowel cancer. The most significant of these highlighted in the new study are age, genetics, lack of dietary fibre, inactivity and high alcohol consumption. Participants with the highest intake of fibre from bread and breakfast cereals had a 14% lower risk of colorectal cancer and the impact of alcohol was also significant and was associated with an 8% higher risk.